So, I know I've been slacking a bit on getting videos up here lately, and the weather here in Western Washington as of the past couple of weeks hasn't helped. Sometimes it's hard to get motivated to put on gear and go wrestle with a toy when the outside temp is topping 90*F and I have no air conditioning. Today I solved that problem in a creative way, that I hope you all enjoy watching 🙂 That dolphin felt nice and super soft and squishy out in the hot sun too! As is my new norm, the remains of the dolphin are available to anyone who wants to pay for shipping. If you're interested, head over to the Used/Abused toys page and send me a mail. As usual, you'll be responsible for shipping costs. This entry was posted on Friday, August 4th, 2017 at 3:09 pm by Mr. MotoX in the category Videos. 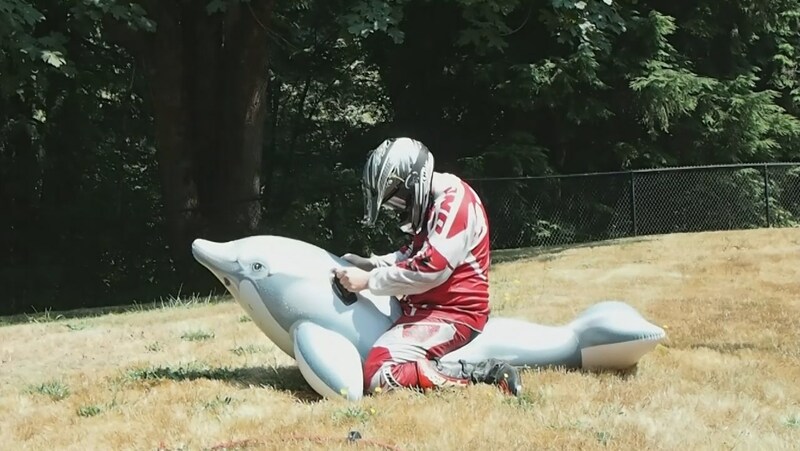 + Show - Hide 4 comments on "Toy-A-Week #21: Wet MX Rider vs Intex Dolphin"
Anouther toy fails to survive the expert hard riding of MrMotoX. That one sounded like a rifle shot when you popped it champ. Nice job. MrMotox never gives quarter never shows mercy.